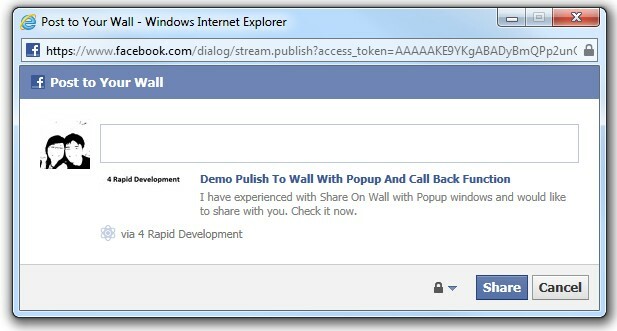 This is just a demonstration on How to allow people post something to their Wall directly on your website with a Popup windows or default Facebook Dialog. After they submit a message or cancel the action, a call back function will be trigger do to something such as posting Ajax to update database to give them a reward or just show thank you message. In this example, you need to load the Facebook Connect JS file and replace my Facebook Application ID with yours. "I have experienced with Share On Wall with Popup windows and would like to share with you. Check it now." When I click on the links, its showing “An error occurred. Please try again later” in popup dude.. I replaced the Facebook ID with my ID, but its showing same Error. I already put the downloadable source code above, along with demo link. That means that I have to create a facebook app so I can do my sharing? What kind of app should I create?? found that your demo is doing same. How can we show a facebook dialog instead of new pop up window?